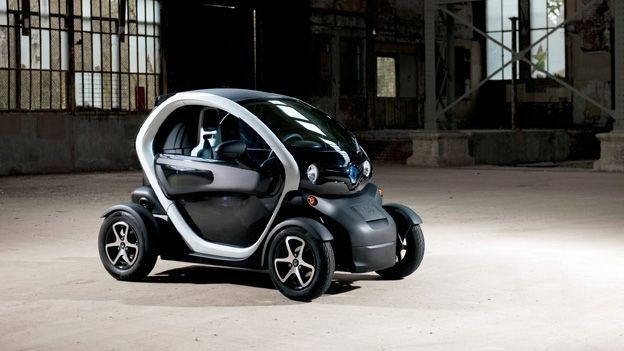 Can the Renault Twizy give electric-powered motoring a boost? This new electric runaround will have you looking like an extra from a sci-fi film, but how is the Renault Twizy to drive? At first glance, the Renault Twizy may seem reminiscent of a Smart car – it's certainly looking to be the next small city runabout. And like the Smart, it has bags of youth appeal too, with Renault spending what must be a small fortune on colourful, gimmicky marketing tools, and even enlisting David Guetta and his decks to help promote it. But that is where the comparison ends – the Twizy is smaller than the Smart, electric-powered, and doesn't even think of itself as a car, instead preferring the term quadricycle, so more like a four-wheeled scooter (and again, claiming to be more economical than the two-wheeled variety). The basic shell has two seats in a tandem arrangement, and a lithium-ion battery can be found in the central spine, driving a rear-mounted AC motor. Add your own touch with your preferred choice of wheels, graphics and doors – either gullwing, a simple bar, or nothing at all for a true golf buggy feel. Neither option is entirely secure, though, as no windows means that the top half of the door space is always accessible and won't stop anybody from leaning in. The argument could be that the limited features inside (less weight means more speed, after all) – and just a couple of storage options – means there isn't much to actually steal, but Renault is offering a lockable bag that fits securely to the backseat if required. Up front, the dashboard area is clean and simple. A digital display sits above the steering wheel informing of speed, remaining battery life and distance, while the controls used to start the Twizy are straightforward – it uses a key ignition, then a small handbrake is hidden under the dash, and there are two buttons, one for drive, the other for reverse. Two small glove compartments sit either side, which could be useful for some of the possible extras, including navigation or a speaker system for an iPod and other devices. In addition to how it drives, the other main concern for the driver is making it go in the first place – and for that you'll need to plug the Twizy in somewhere. Any three-point plug will do, and Renault claims a full charge from empty will take 3.5 hours. With that you can expect between 30 and 60 miles or driving, depending on the terrain, and a the KERS (Kinetic Energy Recovery System) feature helps out here, recharging the battery on the move whenever you take your foot off the accelerator. And performance once on the road isn't bad. If you imagine an enhanced go-kart experience, you won't be far off, and the 40mph top speed – while it may not seem a lot (a lower-powered Twizy 45 model is also available) – in such a small vehicle and with the air rushing through the window-less shell, it still manages to get the adrenalin going. But it's always hard to not be mindful of the remaining battery power, or how far you might be from a place to charge it. While an electric car may seem economical, in terms of initial price and running costs, Renault is actually charging a rental use of the battery, with different price plans available (although the average is £45 per month). This always ensures a healthy battery or the most up-to-date version, but is still something to think about. It's a fun city runabout, both nimble and eye-catching around town. The safety aspects may be a concern for some as the passengers are essentially inside an open plastic shell with just an airbag, while the lack of windows may also be too much. However, as a gateway to the future, and opening up the possibilities of electric cars, we're intrigued.